I choose not to ignore Edward Snowden's awe inspiring strength of moral character when deliberating over the quality of the whistle blowing evidence he uses to support his plea. Furthermore the plea is altruistic in nature. Last night he asked kiwis to seek out stronger democratic processes to protect our human rights to privacy and freedom of association with regards to internet communications. I hope the evidence supplied breaches a threshold of suspicion for a vast majority of New Zealand voters, so that no matter who is elected, the value of mass meta data collection is openly debated and voted upon. Snowden's Speargun revelation felt 100% pure, timely and exactly what New Zealand needs for our democracy to halt the invasive collection of meta data. Sweet thxs llew40 ... attached is a photo of the costume. 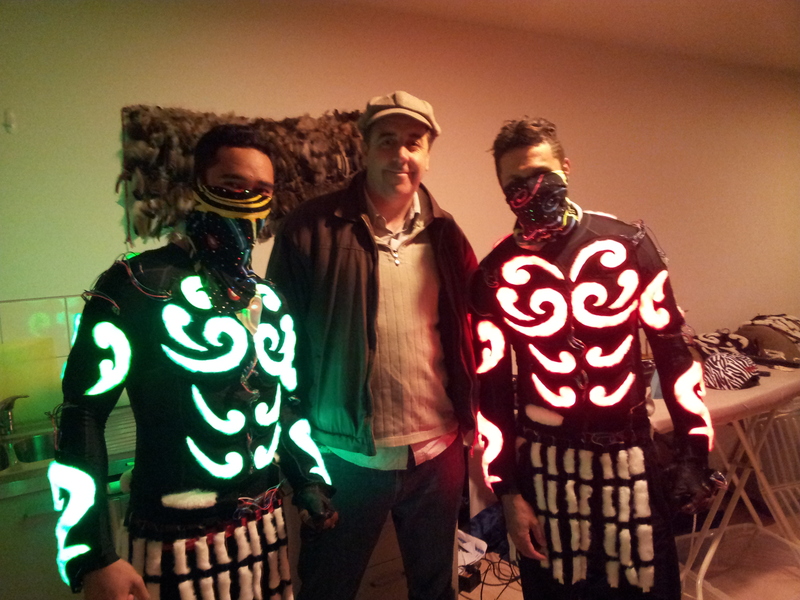 Anyone have pics of the glowing Maori warrior roaming around on Saturday night? Most people I know streamed the rugger from the internet ... does the internet get TV people metered? I believe it will pass 31 August. As a former student president this is sad news indeed. Stripping universities of their self-funding student culture will neuter an effective training ground that has through the years provided many with unexpected opportunities for professionally formative education. Let us hope our students will find fun and creative ways to rise above the ponzi scheme our NZ higher education is becoming. Can't remember the study I read but the researchers determined that 6 year olds tell a whopper of a lie on average every 20 minutes talking with each other. Wonder if politicians do any better? French street artist JR creates inclusive art that engages communities that are the most in need of something more than ordinary. However if his affiliated large scale pasted wall posters started appearing all around our supercity, as is his TED wish, what would our city officials make of it. Askew’s predicament has set my mind spinning as it touches upon many ideals dear to my own identity. Prostituting creative talent within the imposed restraints of an artistically talentless entity tops my list. If an unelected dictator of creative direction and manipulator of local governmental approval required me to paint ‘’people mowing lawns’’ as he did to Askew, I would instantly take my creative energies elsewhere. Please let us not have no-name people blankly painting over inspired efforts to communicate. Like them or not, these sub-cultured communiques provide something more than ordinary for a community to talk about.